Registration: Sorry, online registration for this event has been closed. Please contact the Chamber to register. 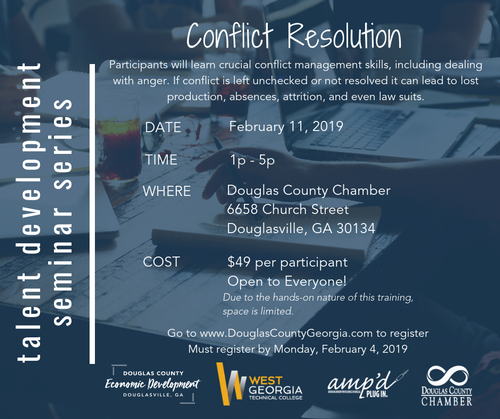 Participants will learn conflict management skills, including dealing with anger. If conflict is left unchecked or not resolved, it can lead to lost production, abscences, attrition and even law suits. $49 per participant. LIMTED SPACE!! Due to the hands-on nature of this workshop, space is limited. Please register by February 4th.